I hope everyone had a fun and relaxing Christmas break, ready for the 2018 grind. In 2017 I rediscovered a love for pink. Yes pink, and it’s no surprise that my beauty product choices have reflected that. 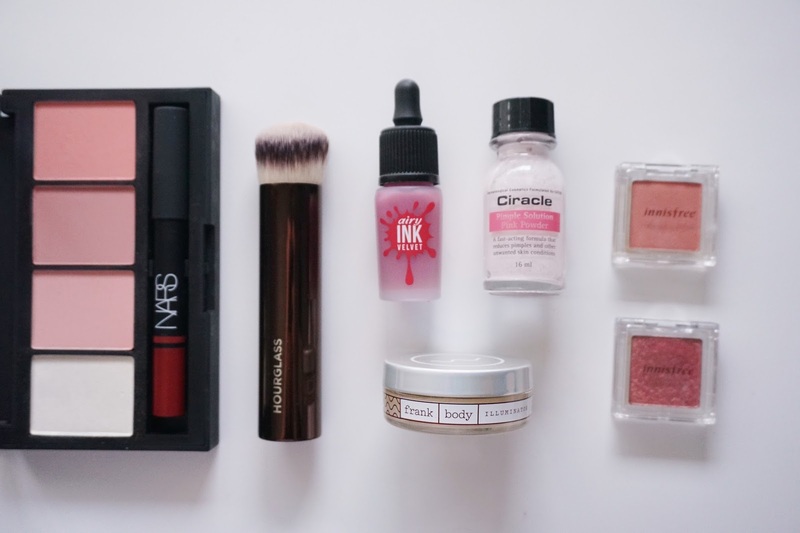 I have a mix of beauty and a couple of non beauty favourites at the end of the post. Happy reading! NARS x Sarah Moon Recurring Dare Cheek & Lip Palette – This is my number one favourite beauty product for January! I used it everyday in Japan for creating a cute peachy glow. For review and swatches click the link above. Hourglass Vanish Seamless Finish Foundation Brush – The brush is well known for its seamless finish and the petit size works really well for me. The fine, densely packed hairs on the brush do an amazing job of creating an even layer of foundation. Frank Body Body Illuminator – This is a coconut oil infused highlighter that can be used on both face and body. The texture is super creamy, easy to blend and doesn’t contain artificial fragrances. I loved using this (particularly hot muggy weather) for a subtle glow. Might post a review and swatches for this one. 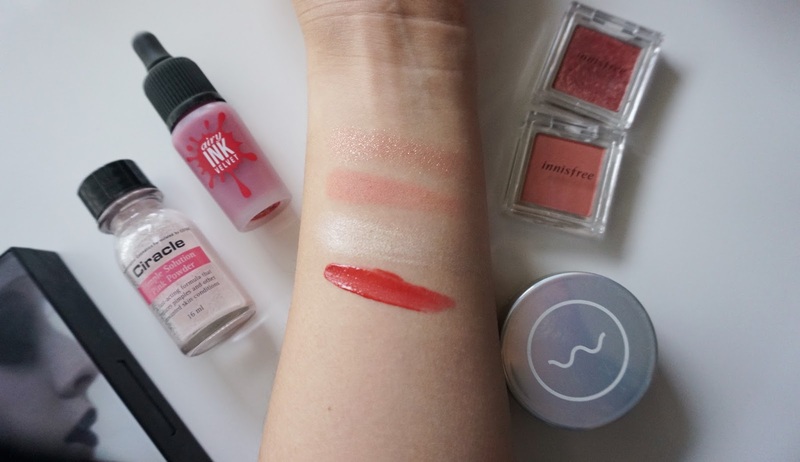 Peri Pera Airy Ink Velvet Lip Tint #5 Elf Rose – The packaging for these tints is sooo cute (could not resist) and compared to most lip tints with a watery or gel link texture, this applies like the name implies, Velvety- almost like silicone primers. It’s easy to apply and I love the colour. Innisfree my eyeshadow #14 (glitter) and #33 (matte) – Despite having several eyeshadow sets and singles, I never owned any pinky shades. Maybe I was too scared to wear something so bright on my lids… but with all the popular palettes out there I knew that I really only wanted to try a pink. I picked up one matte and one glittery shade from Innisfree and used them for most of January. Easy to say they’re my favourite eyeshadows now. 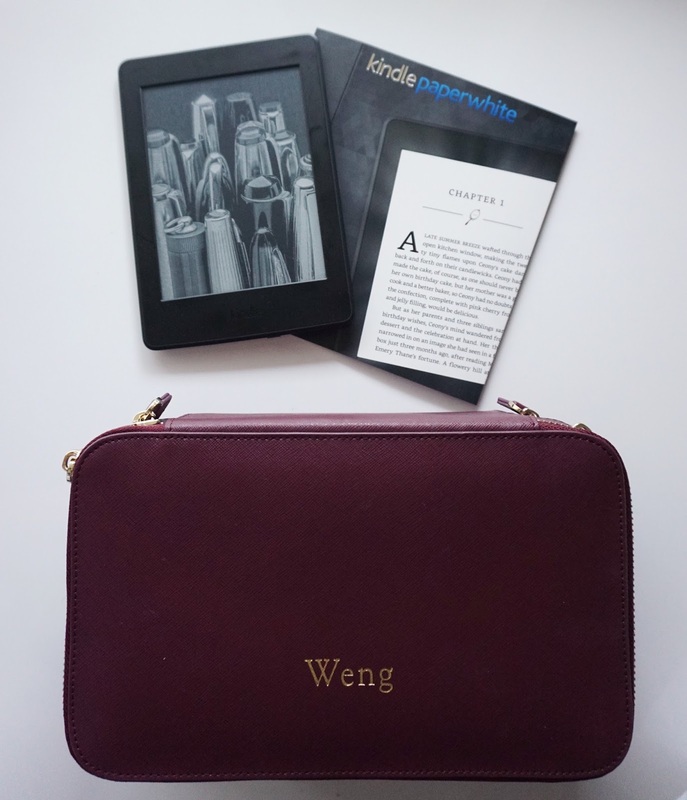 Kindle Paperwhite – With a desire to get cracking on my reading list, I purchased a kindle and subscribed to Kindle Unlimited (mainly to read the Harry Potter series). It makes reading very convenient and lightweight with access to millions of books. At the moment I’m reading ‘Harry Potter: The Goblet of Fire’ and ‘A Beautiful Mind, A Beautiful Life’ by my role model Lindy Tsang. TDE Burgundy Travel Case – For Christmas, my boyfriend and I got each other travel cases (harhar- not planned). The compartments made it was really handy for storing jewellery, samples, makeup and skincare all in one bag. I love it for the thought that went into personalising the colour and monogram as well as the practical design.